I love this poem. 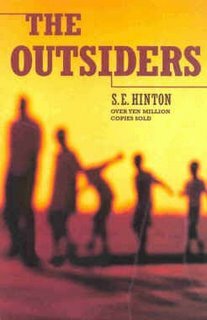 I saw The Outsiders by SE Hinton in the library the other day. I thought about taking it out again to read, even though I must have read it a zillion times. It still makes me cry and just generally be weepy after I've read it. The film as well. My copy of the book is packed away somewhere otherwise I'd go sit in a corner somewhere and read it again (and cry). I am in the process of compiling a book list of good reads from your blog. I love to read it's just been extra hard with 2 kids. But thanks for listing them here. i think i am going out to the garage and dig out my copy... it is probably under "to kill a mockingbird" and "one flew over the cuckoo's nest"! Oh god, just the name Pony Boy makes me teary.